Ok Meatwavers, you're going to have to bear with me for a couple more weeks as I obsess over my upcoming competition. The categories for the grilling portion are so vague—appetizer, two chef choices, and dessert—that they seem designed to drive you mad with self doubt. I was pretty confident that I had the first one down by choosing the best appetizer there is, chicken wings, but now I'm finding myself lost within that decision. My inclination would be to do my barbecue wings, which awarded me a first place last year, but at the same time didn't fare as well in another comp. Now I'm wondering if that first time was just a fluke, are my wings may not be not as great as I think they are. 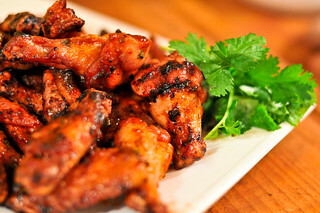 Maybe I should trade the standard barbecue flavors in for something more exciting, like these Cajun chicken wings? What ever internal conflict I have going on considering if these are right for competition, I know for sure these Cajun wings represented one of the best combo of flavors I've put together. It all started with a seasoning that combined a little spicy (black and cayenne peppers), a bit of earthy (paprika and cumin), and a touch of herbal (thyme and oregano) that defines a Cajun rub. 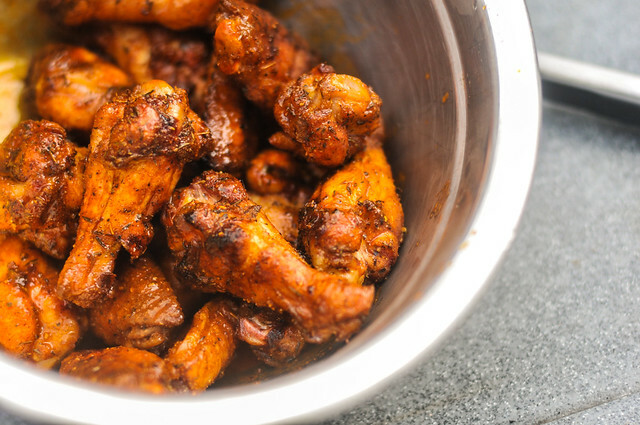 I mixed this with baking powder—which is the secret ingredient to get crisp skin wings on the grill or in the oven—coated the wings heavily in the rub, and let them sit in the fridge for eight hours. While they were resting, I had more than enough time to contemplate the sauce. 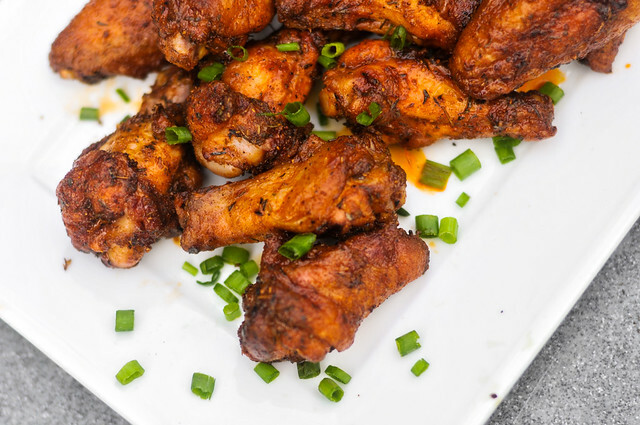 With an already complex rub doing the heavy lifting in the flavor department, I went simple with the finishing sauce by only mixing half Louisiana-style hot sauce and half butter with a hefty splash of Worcestershire. This was enough to add a heat and richness to compliment the rub and not over power it. The wings then went onto a hot grill over indirect heat, covered, and let cook. 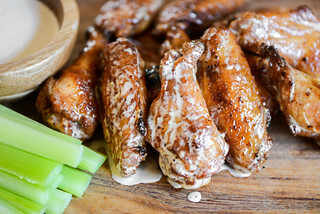 Since wings have their fair share of fat, they can go for a while and stay nice and juicy. It's because of this that I cook my wings until the skin is the desired texture rather than getting the meat to a perfect temperature. I'm looking for a nice crisp crunch to the skin with a bit of browning, which usually takes about 45 minutes on a grill running around the 400 degree mark. Once done, the wings were removed to a bowl and tossed with the sauce, which coated lightly, but enough to give the added boost of flavor I was looking for. I really can't imagine anyone not liking these wings. They were crisp and juicy with a complexity that went way beyond the standard buffalo or barbecue. That layered rub translated to an earthy and spicy crust that was insanely powerful, while the sauce provided a level of heat that left just enough burn without making them so intense they couldn't be eaten one after another. Of course, that heat is the exact reason why I'm torn if these would be best for competition. I can never know if a judge will be adverse to spicy things, but everyone loves sweet, so barbecue sauce coated wings will likely win out, but there's no doubt these would garner a perfect score in my book. 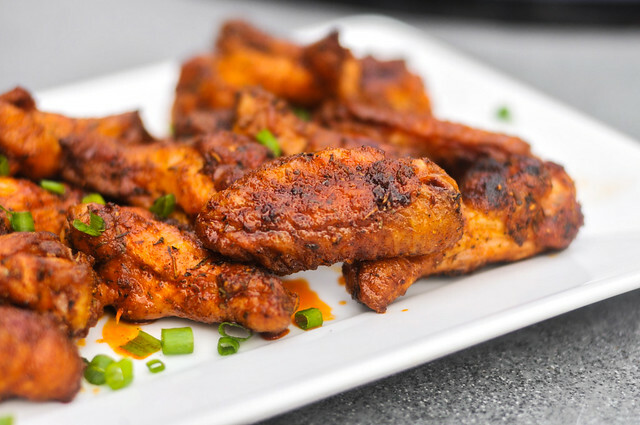 A Cajun spice rub gives these wings a crust layered with earthy and herbal flavors, while a finishing sauce adds a pleasing level of heat to create one insanely awesome wing. 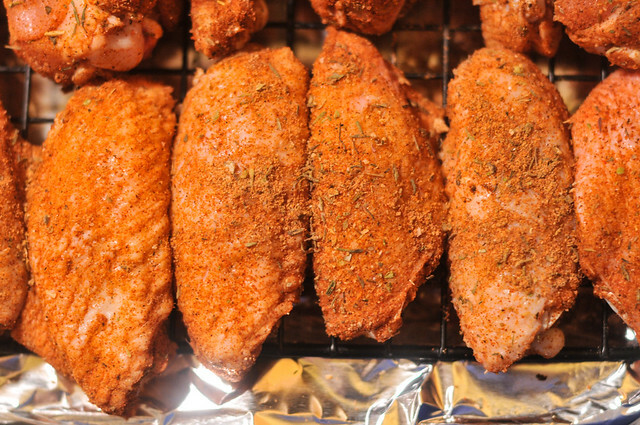 To make the rub: In a small bowl, mix together baking powder, paprika, garlic powder, onion powder, thyme, oregano, cumin, salt, pepper, and cayenne. I like this rub, it's similar to one I use except mine also has white pepper but not cumin. As a judge, I'd like wings in an ancillary category on it's own sometime. But I'm a wing man. Hi there, I have a question about the rub. 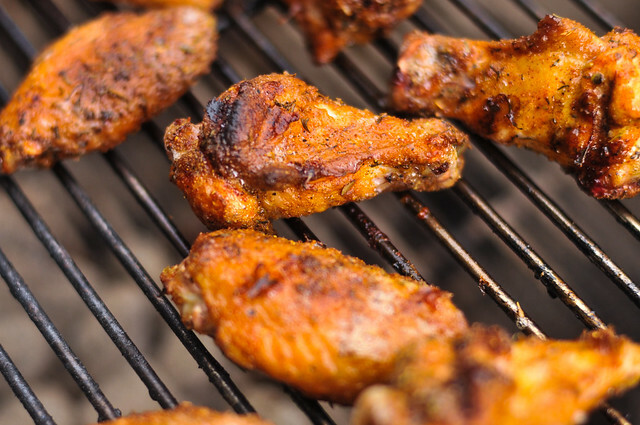 In the picture above, your wings look nice and coated with a red-ish rub. I followed the recipe to a tee but my rub was more grey/brown in color. I attribute this to the baking powder which is white and dilutes the other ingredients that have color (i.e. parika, etc.). I was wondering if I missed anything or there is anything i can do to get the same beautiful red coating you have above? I haven't cooked them up yet, they have been sitting overnight so I cannot comment on taste...but I will as soon as I can. @Kirk Don't worry too much about the color of the rub. 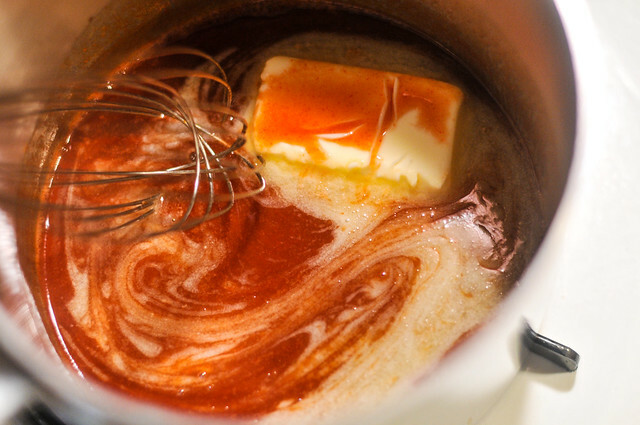 They should still cook up to be nicely browned, and the finishing sauce will give them a nice reddish hue. @Kirk You can crisp them pretty quickly over direct heat after they're done cooking. By that time a lot of the fat has rendered and the skin is slightly crisp, so just a little direct high heat will get them the rest of the way there, just watch out for burning. Made this recipe last night and it was excellent. Thank you for sharing. @Terry B Were your wings over indirect heat%u2014not directly over the coals? 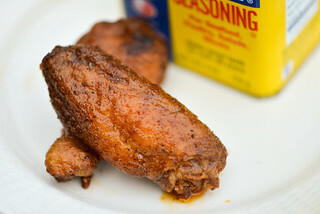 I always cook my wings in the 425°F range on the grill and in the oven and have never had issues with burning. The only time I burnt my wings was at a competition (not good) when I thought I could get them even crispier by putting them directly over a 300°F fire. Lesson learned, always go indirect. cooked the wings, they were great. i used wet apple wood chips on hot coals while on the grill, This turned out to be a phenomenal choice. some of the best chicken i have ever had. @Chris Glad to hear them came out and you liked them. Do you NEED to refrigerate overnight. Have little Tim to do so! Help! Great recipe. I noticed the color difference as well, but after resting in the fridge for 8 hours, the red color came out. By the time they were done cooking they were a great rosy brown. I didn't grill, I used the oven. 400 degrees for 45 minutes. They came out perfect. They were small wings, I think if they were larger I would need a whole hour. Thanks for the recipe.